A city is not just as smart as its people, but also as much as its computing prowess and in that department cloud is the over-arching technology with super computer-like proficiency. 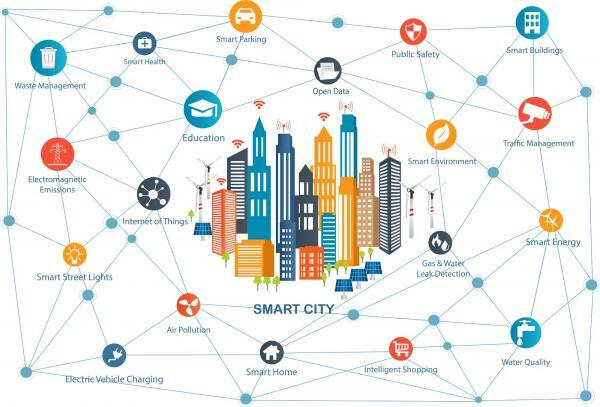 The First-ever IDC Smart Cities Spending Guide released in March this year predicted that spending will accelerate over the 2016-2021 forecast period, reaching $45.3 billion in 2021. In Asia-Pacific (except Japan) alone, the Smart Cities will consume $28.3 billion in 2018 alone! With such investment-heavy projects in the offing, use of the best technology in business is only just organic. To have sustainable economic development and improve the quality of life of citizens, countries all over the world are proceeding towards establishing ‘smart cities’. Now, any city cannot be termed smart if it has certain amount of automation incorporated in its system. A city can be called 'smart' if this economic development and high quality of life is achieved along with organized conservation of natural resources as well as with participation from its citizens. The investments in human capital and technology should produce a smart city that include networking applications, data management and optimization, sensors, software and real-time information analytics that can transform the urban environment and address specific needs. Thus, use of ICT solutions is inevitable. These can help in resolving urban problems and monitor their functions. While new technology and innovation are the need of the hour in any Smart City solutions, there is also the need of great capacity. A common string that connects the entire smart city is data and not just some but terabytes and petabytes of data that gadgets connected to people, buildings and transportation among other things create. Without a strategic approach to control this data smart cities cannot deliver on their promise. Handling such huge quantity of heterogeneous data requires high storage capacity and computing power. For this, the continually developing cloud computing scenario coupled with Internet of Things needs to be widely deployed in cities. The cloud will facilitate storage, integration, processing and analysis of this big data in low time frames. Currently, many citizen services involving IT are delivered by domain-specific vendors through tightly coupled systems. Services like transportation or health care have domain-specific application requirements leading to isolated systems with firmly joined infrastructure and application logic. Scalability is a challenge in these systems, and the creation of new services is hampered due to closed relationships between stakeholders. Cloud solutions can reduce such intergovernmental silos wherein different departments have no idea or understanding of what other departments are doing. Such domain-independent, cloud-based service-delivery platform for smart cities delivers an open and scalable platform and encourages collaboration between stakeholders in both IoT and clouds. Cloud solutions can also support both public and private deployment models. In the former, the stakeholders can keep their applications on a public cloud while in the latter, they can deploy services on equipment at their own sites and feel the maximum potential of privacy and security requirements. The rise of IoT has given birth to thousands of interconnected devices that can be exploited for mischievous purposes posing demonstrable security risks that clouds can aptly eliminate. Clouds also help in extracting maximum value from the data received since not all data needs to go to the same applications all the time, but the right data needs to get to the correct applications at the right time. Clouds can help in managing data across all environments including edge, data center, private, public, hybrid clouds and the billions of connected devices being added to the network. Thus, a well-built cloud platform can offer a cohesive, single-window view with quick scalability that enables quicker processing of the data at the source for faster and more accurate results. Well, we reserved the biggest benefit for the ending note! Clouds can enable operations cost reduction in Smart Cities. A city is not a smart one until it utilizes its resources optimally and that also includes capital.